The location of Cats Hostel Madrid Lavapies hostel is unbeatable. We are 5 minutes’ walk from the bustling city center, Puerta del Sol, a few steps away from the triangle of museums, and the Atocha train station. Our neighborhood, the multicultural Lavapies, is one of the trendiest districts. You will love walking and admire the graffiti, always in constant evolution. You can have a drink in the craft breweries and try international food in its many establishments and markets. And you'll want to browse the local businesses full of original products! Cats Hostel Madrid Lavapies is designed for those travelers who want to explore the Spanish culture: it is close to all the most emblematic sites of Madrid. Also, for travelers wanting to enjoy the Madrilenian nightlife: it is close to the party areas within walking distance! But we welcome the most relaxed travelers too: you can sit in our cozy common room, having a coffee or tea, or go up to our rooftop and soak up the magical Spanish sun! Our rooms: You can choose between private rooms or shared rooms with 4 and 6 beds, these have individual security lockers, as well as personal plugs and reading lamps per bed. 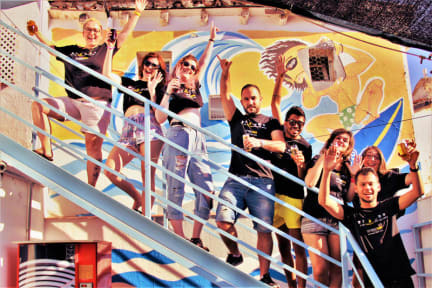 Our activities: We have one of the most fun pub crawls in the city, the perfect event to meet the other travelers who stay at both of our Cats hostels in Madrid. In the city walking tour, our guides will give you very interesting information, so you can learn a lot about the city in a very short time! But there is also a tapas tour, craft beer tour, etc. There is something suited to each person's taste! And if you are looking for other types of activities, our receptionists are available 24/7 to help you discover Madrid and its surroundings. Services: Breakfast is included, it is buffet-style and it is served in our common room. There is free Wi-Fi throughout the building and computers for guest use. On departure day we offer the possibility of storing your luggage for a little extra while you say goodbye to Madrid! Had an amazing time at CATS, definitely one of the best decisions I made during my trip was staying here. It's a great place to meet people (especially if you're travelling alone), in the best location, and pub crawls with Sebastian is one of the biggest highlights! I will definitely stay at CATS for all my future trips to Madrid🤘. Had a great time at CATS! The pub crawls were fantastic, Sebastian is the best pub crawl guide. Totally would come back and stay again :) such a welcoming places with awesome staff. Had a fantastic stay at CATS! 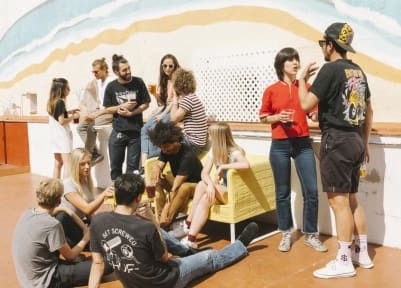 Awesome vibe- perfect balance of chill and party. Staff were super friendly and created a great atmosphere for socialising. Pub crawls were plenty of fun and dinners offered at the hostel bar were a nice touch. Security was thorough and the dorms/bathrooms were clean. Great location and easy to get to from the metro. Enjoyed Madrid a great deal (in part due to the fantastic experience and friends I made at CATS) and would love very much to come and stay here again! It is very close to metro and quite easy to find. The place is clean. High-tech doors & lockers make me feel safe. Amazing to have free great breakfast for this price. Staff are also nice. Recommended. Great Hostel in a superb location. Super clean and I love the wristband lockers, nice little touch! I had a good time ar the hostel. The staff were wonderful and helpful. The place was clean and safe.